Farrington coach Allan Silva told his team to make some drastic changes when the Governors fell behind a smaller, slower Pahoa team after one quarter in the opening round of the Hawaiian Airlines/HHSAA Division II State Boys Basketball Championship tournament. The Governors switched to a stifling man-to-man defense, and rebounded to strafe the Daggers 56-46 last night at Kaimuki High School gym. Farrington (11-5), of the Oahu Interscholastic Association, moves on to face top-seeded University High of the Interscholastic League of Honolulu tonight at 8 p.m. in the second quarterfinal matchup at Kaimuki. "Every time you're down you get concerned," Silva said of the early deficit. "Our defense just wasn't doing it, so we went to a man-to-man (scheme). We were able to make an adjustment, created a lot of pressure and helped each other out." With the score tied 9-all with less than 10 seconds to go in the opening period, Pahoa's Marcus Rintacutan nailed a high-arching 3-pointer and was fouled in the act. The senior connected on the free throw to give his team a 13-9 lead to end the period. But the Daggers (8-10) of the Big Island Interscholastic Federation lost their edge, managing just three points -- all on free throws -- in the second quarter. Farrington outscored Pahoa 13-3 in the period, with six points coming off easy breakaway layups generated by the pesky trapping defense. The Governors seized the momentum and took a 22-16 lead into halftime. "We we're dribbling into their (defensive) traps too much and had too many turnovers," said frustrated Pahoa point guard Vincent Sanekane. The aggravation continued for the Daggers as the team was outscored 18-9 in the third period, and slipped into a 40-25 hole. The damage would have been worse had Sanekane not nailed a 3-pointer at the buzzer. Farrington kept rolling with a 9-0 run to begin the fourth quarter. The lead gave Silva the chance to rest his starters in preparation for tonight's contest against the Junior 'Bows. Jordan Ibana, normally a role player unaccustomed to scoring, led the Governors with 11 points off the bench, including the teams' lone 3-pointer. 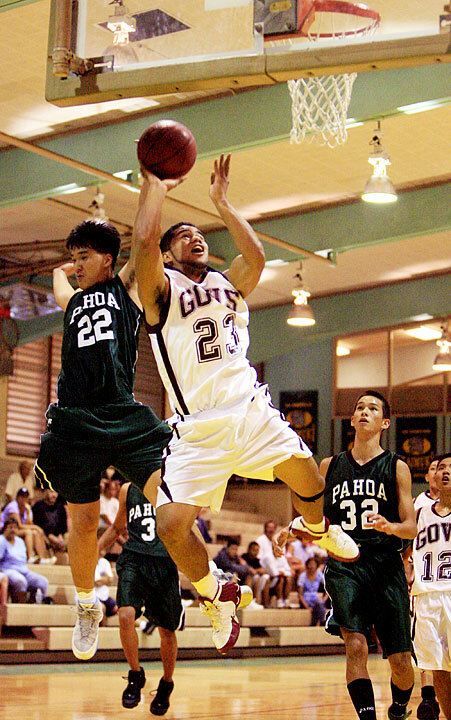 The agile guard knifed through the Pahoa defense, often finishing with high-percentage layups, as did fellow guard Christian Hernandez, who finished with eight points. In defeat, Sanekane carried his team with a game-high 20 points, 11 of which came in the fourth quarter. The senior drained four treys in the game, and helped to keep the score respectable down the stretch. PAHOA--Jonathan Viernes 3, Clyde Ebanez 0, Reynaldo Corpuz 0, Sheyton Waters 6, Manuel Sorcy 2, Vincent Sanekane 20, Marcus Rintacutan 4, Anthony Murray 9, Jordan Viernes 2. FARRINGTON--Jordan Ibana 11, Christian Hernandez 8, Dio Labayog 0, Oscar Carter 5, Steven Kamano 2, Bryson Leopoldo 5, Elijah Lesu 5, Ziggy Muramoto 4, Elijah Filifili 2, Rey Bartiana 2, Glenn Ernest 6, Cody Hua 6. 3-point goals: Pahoa 7 (Sanekane 4, Rintacutan, Jon Viernes, Waters), Farrington 1 (Ibana). The Tigers outscored the Cardinal 37-27 in the second half, and advanced into the quarterfinal round. After falling behind 11-9 after one quarter, McKinley of the OIA roared back with an 11-2 run to take a 20-13 lead midway through the second quarter. Earvin Sione led McKinley with 14 points, while St. Joseph's Cassius Aiwohi-Kegler poured in 17 in defeat. McKinley advances to play fourth-seeded Seabury Hall of the Maui Interscholastic League tonight at 6 at Kaimuki. ST. JOSEPH--Hunter Lee 0, Jake Lee 2, Royden Masulit 13, Sekona Holani 2, Paul Battad 0, Cassius Aiwohi-Kegler 17, Nathan Lee 4, Cruz Martinez 0, Keyin Crudele 0, Jacob Andrade 4, Nick Gomes 0, Devyn Monberg 0, Jess Maiava 0, Thomas Pegues 6, Jacob Carroll 0. MCKINLEY--Jelani Thabiti 0, Oliver Diguc 3, Tilton Kaluna 12, Bryce Ishikawa 0, Ryan Flordeliza 0, Jefferson Pou 4, Austin Yoon 0, Earvin Sione 14, Nainoa Lessary 10, Rey Vinvent Enanoria 9, Jonathan Lee 11, Ian Paez 0, Issac Iuta 0, Travis Asing 0, Julius Borje 0, Marshall Miyasaka 0. 3-point goals: McKinley 1 (Enanoria), St. Joseph 3 (Masulit 3). Carl Adolpho scored 16 points to lead the Farmers past the Eagles. Molokai advanced to the quarterfinals against Kohala today. Jason Iha led Hawaii Baptist with 12 points. HBA--Reid Morihara 0, Dayne Kato 0, Daniel Baek 3, Jon China 1, Joshua Thompson 0, Jason Iha 12, Ryan Sakai 2, Joshua Baek 6, Jason Liang 10, Phillip Sarubbi 6, Sean Lum 3, Dominic Hart 6. MOLOKAI--Jacob Adachi 0, Jacob Esteron 0, Micah Ritte-Manangan 5, Eben Napoleon 12, Eddie Delos Reyes 0, Jared Sasada 0, Nohea Pangkee 9, Carl Adolpho 16, Tyler Sullivan 10. 3-point goals -- HBA 2 (D. Baek, J. Baek), Molokai 1 (Ritte-Manangan). Tri Bourne had a game-high 20 points to power the Dolphins, who moved on to play Aiea in the quarterfinals today. Basil Walton had 18 to lead the Raiders. AOP--Tri Bourne 20, Hoyt Fuller Jr. 5, Joshua Oreta 0, Brad Foster 9, Keoni Daniel 18, Joshua Chaffin 2, Koa Gomes 4, Mina Gould 2. KAUAI--Bradley Semana 2, Travis Stancil 0, Justin Ramos 2, Jordan Cox 15, Tyrus Ceria-Lux 2, Travis Stine 13, Basil Walton 18, Teila Huni 0, Damien Girard 0. 3-point goals -- AOP 0, Kauai 3 (Cox 3).